Manhattan is an Eclipse plugin, that allows to visualize projects in the workspace. The first goal has been achieved by creating a basic port for Eclipse of CodeCity, the visualization tool by Richard Wettel. Team activity is the set of code changes performed by each developer. Knowing what other developers are working on reduces the chances of conflicting modifications and allows a better understanding on how a project is evolving. Lile Hattori created Syde, a plugin which notifies every developer about the code changes performed by the other members. Notifications are done via SWT views. Through a few simple visualization techniques, Manhattan highlights the changes reported by Syde. I'm writing Manhattan as my master project under the supervision of Prof. Michele Lanza, Alberto Bacchelli and Lile Hattori. Install both features in the update site and give Manhattan a try! A tutorial on Manhattan from Francesco Rigotti on Vimeo. After creating the meta-model for the code artifacts, Manhattan will visualize the project. For projects with hundreds of classes, this will take some time. 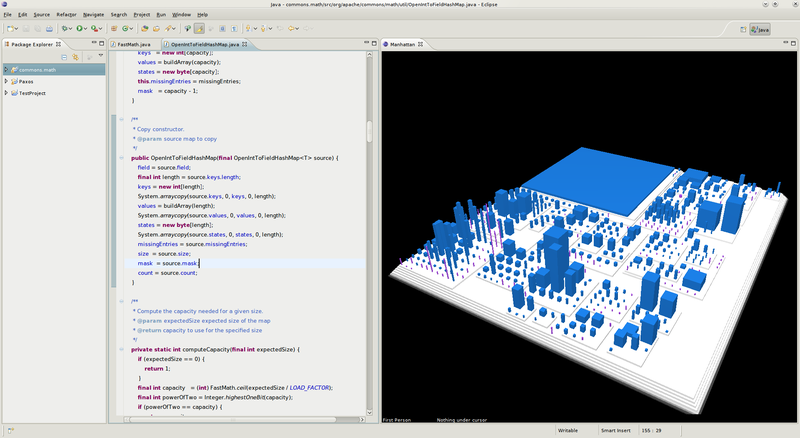 The screenshot below shows the view when visualizing CommonsMath from Apache. The city base represents the project itself. Packages and namespaces are represented as city islands. Containment relations are represented by stacking sub-packages on top of their parent package. Classes and interfaces are represented as city buildings: classes are blue cuboids and interfaces are purple cylinders. The width of a building represents the number of fields, while the height represents the number of methods. Since complex classes (many fields and many methods) will be represented as large buildings, this metaphor works very well in exposing complexity. The view is made of two components: an OpenGL canvas and a status bar. The latter shows the selected navigation mode on the left and, on the right, information about the code artifact under the cursor. If a building picks your interest, right-click on it to open the corresponding file in Eclipse's editor. The biggest improvements in this release are the integration with Syde and a caching system for meta-models. Check out the videotutorial for both the old and new features. I'm proud to announce the first release of Manhattan. This version is very basic and is not meant for use in production. Check the section on the right to see how to install the plugin.